With an atelier and a private label, OAR, Osman Abdul Razak is back on Khader Nawaz Khan Road. FROM IT consultant in 2007 to gentlemana��s tailor, Osman Abdul Razak has come a long way, and yet he says his journey has only begun. Last Decembera��s floods had destroyed many stores on Khader Nawaz Khan Road, Razaka��s Gabbana.Life being one of them. But the young designer is back in the reckoning, with an atelier studio no less, just a few stores away from his earlier address. This time, he has included a workshop that befits his bespoke journey. And a team of around 15, which includes his lovely wife, is all set to take the private label, Osman Abdul Razak (OAR) to the next level. With an industrial theme, high ceilings and furniture sourced locally, Razaka��s store will offer both OAR and daily casuals. There are half-canvased, full-canvased and fused suits and you will be relieved to know that they will not cost outrageous sums of money (the half-canvased suits begin at Rs 30,000). Razak, who is also an image consultant (a skill he discovered back in 2012), communicates the importance of fit, fabric and construction to his clients. His label is going beyond the a�?celebratory fashiona�� tag, and senior corporates are joining the existing clientele of grooms and jeans-to-suit converts. He is also getting busy as a travelling tailor (he is quite happy with the term, and the respect it commands in sartorially forward circles), and has been dashing off to Hyderabad and New Delhi on work. a�?Bengaluru has more than its share of gentlemena��s tailors. 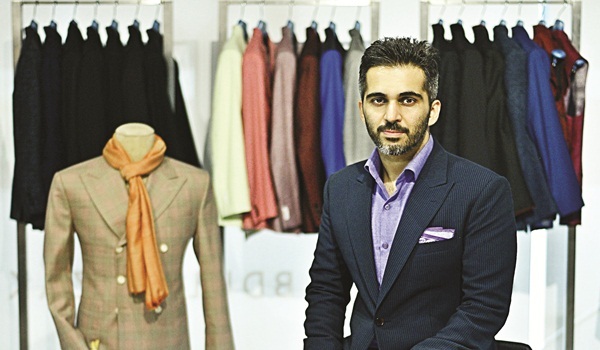 Ita��s Hyderabad, with its ready to wear stores, that has a growing market for bespoke and made to fit suits,a��a�� says the 34-year-old, who also impresses upon his clients the impact made by good hair and teeth. The first is addressed with appointments with his go-to hair stylist. Razak also stocks other accessories that make a mana��s wardrobe, be it laptop bags and trunks from handmade leather brand Nappa Dori, bowties and more from The Bro Code or shoes from Shutiq. Just no T-shirts and denim (easily available elsewhere, he shrugs). His role as image consultant will include wardrobe edits, so Razak is always hunting down classic brands to collaborate with. And while he hopes to get certified in Italy soon, as a pattern cutter (Tom Ford and Paul Smith are his inspiration), he is currently fuelling a movement, #DapperDa, to unite Chennaia��s arch-exemplars of natty style.